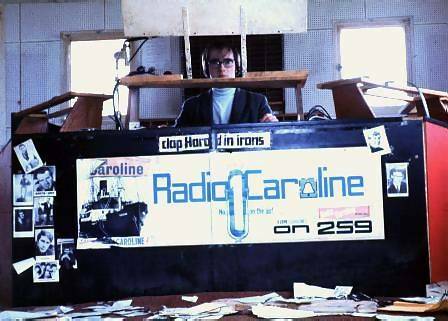 Chris Davies visited the two Radio Caroline ships while they were in harbour in Holland. 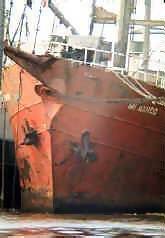 They had both been impounded by a creditor, the Wijsmuller Tug & Salvage Company, in 1968 and were lying derelict. These photos were taken in 1970. 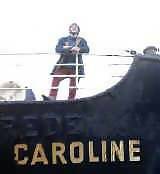 Above: Chris on the deck of the Caroline North ship, the mv Fredericia. Left: His friend Norm in the Caroline North studio. The ship was deserted and the two just climbed aboard. 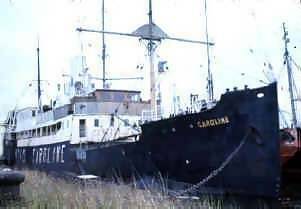 They did not board the Caroline South ship as it looked like someone was living there. Above: The Caroline North ship. Left: the two ships side by side. This photograph has been doctored. Chris says he air-brushed a much larger ship out of the picture. It was behind the two Caroline vessels. The Caroline South ship, the mv Mi Amigo. The ship was full of the paraphenalia one would expect to find on any radio station. 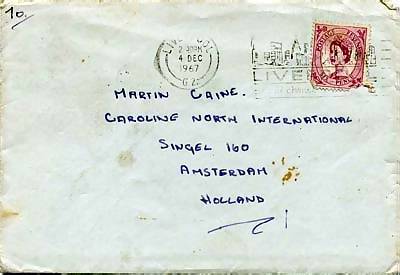 This is a mis-spelled fan letter addressed to DJ Martin Kayne. Many thanks to Chris for sharing these with us. There are more pictures of the two Caroline ships from about the same time in Hans Knot's and Fred Kooreman's photo albums.